One of my darling girl dogs is my foster Pippa. The rescue group calls her by a different name but as she never had a name …. Well Pippa is her name. Pip is considered a hospice dog because she has a collapsing trachea. Everything about Pippa is a victory. She was a puppy mill rescue. 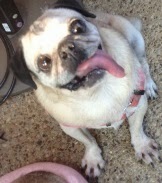 I am her only foster but the veterinarian clinic that works with the pug rescue staff is marvelous. They told me how to care for her health issues and that she was skittish. Yes, this girl had never been socialized nor had any loving human contact. Her feet are splayed because of her life in a cage. She doesn’t have any teeth. I know the vet gave good medical care and was patient with her, but the psychological damage is what a foster or adopter need to manager. Rescues cases are all different. On a great blog I follow http://caninepsychologyschool.wordpress.com/ by lisatenzindolma gives an update on a rescue Living with a Feral Dog: Charlie, 6 Months On Her blog and her excellent work are worthy of a look. Just like people animals will have emotional, psychological scars. Learning to live in a house with a human and other dogs has taken time. She had no concept of what to expect or what was expected. Every step and everyday is a victory. Pippa has been adaptable and skittishly loving. Now she knows I am her family and has come so very far. I believe she feels safe and loved. Pippa takes joy in her new life. An example, when she saw one of the boy dogs scuffing his feet behind him after eliminating, she immediately copied. That girl will scuff and scuff and look so pleased. Pippa’s collapsing trachea is getting worse even though she is on medicine. She has trouble breathing, she hacks and struggles. Seeing her struggle is painful. And my job is to love her and try to keep her calm. Anxiety makes her breathing problem worse, she gets scared because she can’t breathe – it is a vicious cycle. I wouldn’t trade a minute of my time with Pippa. If you are thinking of fostering, rescue please know that many of these animals have had a life of despair and heartache. You must be willing to make a commitment. And as with any animal in your care they are a lifetime responsibility. Be kind and patient and loving. Joy will come to you multiplied. What the Animal Family Had to Say This Morning. Pippa & Jelly – Good Morning. Doggie P said, “Even though I am coughing like honking goose I want to eat, now, now and more! I like the special cheese treat but stop with that syringe stuff already.” (collapsing trachea – more on next post).